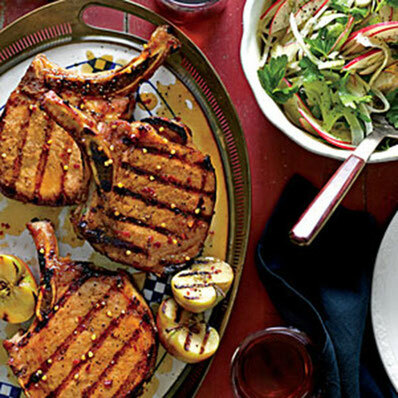 Grilled Pork Chops with Apple-Bourbon Glaze . . .
of small apples brushed with the glaze. 1. Stir together first 5 ingredients. Brush pork with olive oil, and rub both sides with sugar mixture. Place pork in a 9- x 13-inch baking dish; cover and chill 12 to 24 hours. Remove pork from refrigerator, and let stand at room temperature 30 minutes. Meanwhile, prepare glaze. 2. Preheat grill to 350° to 400° (medium-high) heat. Grill chops, covered with grill lid, 6 to 8 minutes on each side or until almost done. Brush chops with glaze; turn and brush other side with glaze. Grill, covered with grill lid, 2 minutes. 3. Repeat process, without grill lid and turning chops every 10 seconds, until glaze thickens and chops are cooked through. Stir together first 5 ingredients in a medium saucepan. Bring to a boil over medium-high heat. Reduce heat to medium, and simmer, stirring occasionally, 13 to 15 minutes or until mixture has thickened and is reduced to about 1 cup. Stir in red pepper.